Kindergarten through 3rd grade studies consist of questions designed to be discussed and answered with a parent. In addition to questions, 4th through 7th grade studies provide age appropriate commentary along with a list of difficult or challenging words and their meanings. A sample lesson is pictured at right. 8th grade through high school lessons have the same commentary and formatting as the adult studies. Questions correlate with the 4th through 7th grade studies to give siblings the opportunity to do their homework together. Youth lessons currently available for download are listed below. Acts is the book of the church’s beginnings with the Holy Spirit coming in power. It is a book of firsts: the first preaching of the gospel by the apostles through the power of the Holy Spirit, the first churches, the first missionaries, the first time believers were called “Christians”, the first Gentiles accepted into the body of believers, the first church council, the first Christian martyr, and more. What a blessing to have this record of our spiritual heritage. As Christians, it is something we all need to know and understand. James has been called the most practical letter in the New Testament. Pearl Hamilton, founder of Disciplers Bible Studies, memorized the entire book as a child. She called it the “Proverbs of the New Testament”. James’ premise is that our words and our works should demonstrate our faith and that faith without works is a dead faith. In other words, true faith will bear fruit. 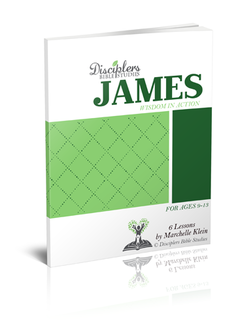 Study James and his godly wisdom to be challenged in your faith and to lead a fruitful life. Judges takes place after the death of the great and godly leader, Joshua. Israel was just getting settled into their inheritance in the Promised Land. It should have been a hopeful time, but it became a sad, repetitious cycle of sin, discipline by God, crying out to God, and deliverance. It is a story of man’s failure and God’s faithfulness. The little book of Ruth, on the other hand, gives another picture of life during this time and is like a ray of sunshine on a cloudy day. Ruth, a young Moabite woman and widow of a man of Israel, clings to her mother-in-law and God rather than her homeland and its idols. These are her faithful and touching words to Naomi, Entreat me not to leave you, or to turn back from following after you; For wherever you go, I will go; and wherever you lodge, I will lodge; your people shall be my people, and your God my God.